The amazing accomplishments of Sturgeon Bay shipbuilders come to life in the rich Peterson Gallery. See everything from handmade Indian dugouts and birch bark canoes to models of multimillion-dollar naval vessels and luxury yachts that were all built in the area. And, get to know the craftsmen, welders and entrepreneurs who put their brawn and brains to work to make Sturgeon Bay the shipbuilding capital of the Great Lakes. Historic photos, newspaper stories and personal letters tell the story of Door County’s early maritime days. Learn about the first ferries and bridges that spanned the canal and what those meant to early settlers. See the area during its busy lumber days when wooden schooners transported tons of virgin trees to growing cities throughout the Great Lakes. A three-dimensional diorama captures an 1880s working pier, complete with its hustle and bustle of commerce. Learn about S.S. Badger, the largest car ferry on the Great Lakes, and its launch that had a minor glitch. The historic, two-story Badger still sails today, carrying passengers, their cars or RVs across Lake Michigan each spring, summer and fall. Take in a video that traces the area’s massive war effort, which relied on women to fill many construction roles. Meet Mercedes Herman (aka Sturgeon Bay’s Rosie the Riveter) who worked in the Sturgeon Bay Shipbuilding and Dry Dock Company shipyard as a welder during WWII. And, don’t miss the dramatic video of a naval vessel launch. Watch black-and-white archive footage that captures the pomp, circumstance and excitement of the day. Travel back in time as the ship is side-launched into the bay, creating a spectacular launch wave as it enters the water. Get to know iconic Sturgeon Bay shipbuilder names like Leathem D. Smith Shipbuilding, Sturgeon Bay Shipbuilding and Dry Dock Company, Peterson Builders and Palmer Johnson. See the WWII-era submarine chasers, luxury high-performance yachts and remarkable wooden-hulled minesweepers these companies built. 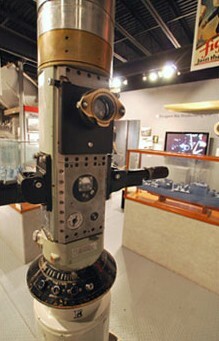 Finally, don’t miss the working submarine periscope that gives you a birds-eye view of the Sturgeon Bay waterfront and the active shipyards nearby. “STURGEON BAY, Wis. (WFRV) – Northeast Wisconsin is connected to the water with Lake Michigan defining the state’s eastern shoreline. Because of that, shipbuilding took root and grew in areas like Sturgeon Bay nearly 190 years ago. 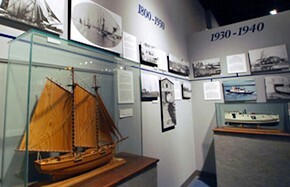 Local 5 takes a look at our rich maritime history, which in turn creates a strong future. Nothing defines the city of Sturgeon Bay more than the shipyards that have been the county’s largest employers for nearly a century. Those shipyards put the city on the international map, building lakers that moved goods throughout the country, yachts that met the specification of the most discerning buyers from around the globe, and warships that helped defeat the Nazis in World War II. In this video you’ll learn how Sturgeon Bay became known as one of the best shipbuilding cities in the world and how the industry grew to define the city.